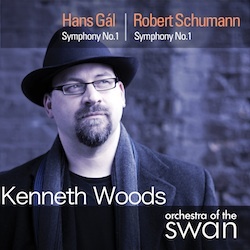 With this release, Kenneth Woods and the Stratford-upon-Avon based Orchestra of the Swan make musical history by completing the first-ever recorded cycle of the Symphonies of Hans Gál. Vienna-born Gál’s Symphony No. 1 was written in 1927 when the composer was at the height of his powers, belying the turbulent central European events which would forever effect him in the coming years. The music is bold, uninhibited and persuasive. The writing is virtuosic and the orchestration is colorful. Gál’s First Symphony reflects the essense of his compositional voice, to which he remained true throughout his nearly century-long life. As today’s most committed champion of Hans Gál’s music, which remained relatively dormant throughout the 20th century, Kenneth Woods has captured the imagination and introduced a new generation to Gál’s wide-ranging and extensive oeuvre. He continues his coupling with the Symphonies of Gal’s forebearer, Robert Schumann, with the 19th-century composer’s exuberant First, the “Spring” Symphony, composed some eight decades earlier.